Sunday March 31, 1974 is a landmark date in the history of rock music. It is now celebrated in the multi format release of a rare recording made at legendary London venue The Rainbow, of a concert by a then up-and-coming band called Queen. Few who turned up for that iconic performance could have predicted they would go on to become arguably the world's best and most successful rock group, although many more may have suspected it after this stunning show. Truly great stage presence is a rare gift for any band. Sure, some acts can get away with just standing around and playing their hits, but a really amazing concert experience requires that little extra something -- that indefinable spark of charisma and electric personality. That ability to reach out into the crowd and command an audience, fully connecting with every single fan no matter how large the venue is. Led by the unique musical charms of Freddie Mercury, Queen had that singular talent, turning every one of their performances into something special, and 'Live at the Rainbow '74' is no different. Featuring the band after the release of their first three albums, the show captures the group at the cusp of super stardom, revealing their early penchant for kinetic showmanship. Filmed over two nights at the Rainbow Theater in North London in November 1974, the concert spotlights the band during their "Sheer Heart Attack Tour." The lineup consists of Brian May on lead guitar, John Deacon on bass, Roger Taylor on drums, and Freddie Mercury as the lead vocalist and pianist. Primarily made up of tracks from the group's first three albums, the songs carry a distinct mixture of styles, blending hard rock and progressive rock sensibilities with a more melodic and occasionally even operatic quality. With that said, these earlier records don't quite carry the same pop friendly stadium rock style that the band's later anthem hits ("We Will Rock You," "We Are the Champions") would become famous for. After a brief intro following the band into the Rainbow Room, we quickly segue straight into the show. Opening with a rousing rendition of "Now I'm Here," we start in darkness only to have the lights kick on and off during key beats before finally bathing the stage in a warm glow as the band really kicks it into high gear. From there, we're treated to an energetic and varied view of the show, complete with close-ups, wide-shots, zooms, and frequent dissolves. Likewise, the lighting design keeps things interesting, washing the screen in moody oranges, greens, and blues, nicely complementing the tempos of each song. And what would a rock show be without smoke? Well, I'm not sure, but fret not! We get plenty of atmospheric fog. Of course, Freddie Mercury is not one to be up-staged by mere lights and camera angles, and the legendary front-man commands the spotlight. First decked out in all white and then sporting a black ensemble complete with diamond claws (apparently a gift from the devil himself), the only thing louder than the singer's costume choices, is his voice. And wow, what a voice it is. With incredible range and seemingly effortless poise, Mercury carries us through the set-list without skipping a beat, infusing each note with deep emotion and charm. Likewise, the musician will playfully address the audience in between tracks to introduce new songs, maintaining a fun and intimate rapport with his fans. The rest of the band also get their moments to shine keeping things from becoming a one-man show, and we're treated to some fantastic drum and guitar solos as well. 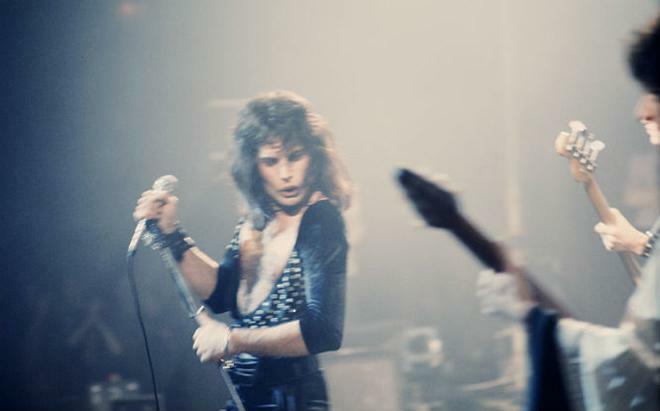 Highlights include spirited performances of "Killer Queen" and "Keep Yourself Alive," and the band's climactic take on "In the Lap of the Gods… Revisited" is simply riveting. Really, there are no missteps throughout the entire production and each song is fully realized. Together, Mercury, May, Taylor, and Deacon create a truly engaging concert experience, using a little bit of rock star flash to enhance but not overpower their music. Instead, everything flows together perfectly, and each band member is firing on all cylinders, bringing the group's unique sound to life with a dynamic spark. A band's music might be great on its own, but without worthy stage presence, live performances can easily fall flat. Thankfully, with Freddie Mercury's wide vocal range at the helm, 'Queen: Live at the Rainbow '74' could not be further from flat. 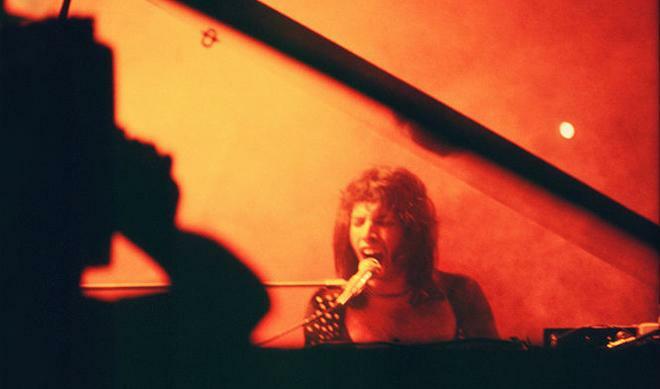 Packed with great tracks from "Queen," "Queen II," and "Sheer Heart Attack," the concert offers a rousing peek into the band's early evolution as musical stars -- triumphantly ushering in a lasting rock and roll monarchy. 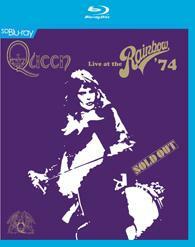 Eagle Rock brings 'Queen Live at the Rainbow '74' to SD Blu-ray on a single BD-25 disc that comes housed in a keepcase. After loading, the disc transitions straight to a traditional menu screen. An insert with track listings and photographs is included as well. The movie is provided with an upscaled 1080i/AVC MPEG-4 transfer in the 1.33:1 aspect ratio. As part of Eagle Rock's SD line of Blu-rays, the video here is actually standard definition material being upconverted, and the original footage appears to have been shot on SD tape. With that said, given the inherent limitations of the source, the image gets the job done just fine. The source print is in pretty good shape, but artifacts usually associated with analog tape recordings of this nature are present frequently throughout, including ghosting and scanlines. Likewise, the video has an overly smooth quality in motion. Detail is of course limited by the SD source, offering a soft and flat quality that lacks the fine clarity of a true high definition picture. Still, the picture is decent for what it is, highlighting the band's costumes and the concert's moody lighting schemes well. Though comparatively muddy, colors are rendered nicely, and blacks are deep. While most of the problems here are simply a result of the original shooting methods, minor banding and false contouring do crop up from time to time, particularly around the concert set's lights. Since this is an upscaled SD presentation, it makes scoring the video transfer a little difficult. For the most part, this is as good as this concert could possibly hope to look. With that in mind, despite the mediocre score, fans should be very pleased with the results here -- as long as they go in knowing what to expect. The film is presented with an English DTS-HD MA 5.1 and LPCM 2.0 track. Though not quite as impressive as some other music mixes, this is a strong audio presentation that gives fans a great in-home concert experience. Vocals are clean and full, highlighting Mercury's trademark voice and incredible range. With that said, they don't seem to be as percisely relegated to the center channel as other concert mixes. The show boasts a fairly spacious soundstage, spreading instruments around the room with strong stereo separation and solid surround activity. Rears are mostly used for echoes of music cues and crowd reactions, but this added presence helps to expand the audio well. Dynamics are good, offering some welcomed low frequency kick that bolsters the rock songs with a head-banging punch, but range is a tad flat compared to modern mixes, causing some of the louder songs to sound a little indistinct. The LPCM 2.0 track is comparable in design and quality to the 5.1 mix, but lacks the added benefit of the rear channels. Thankfully, there are no age-relatied technical issues. 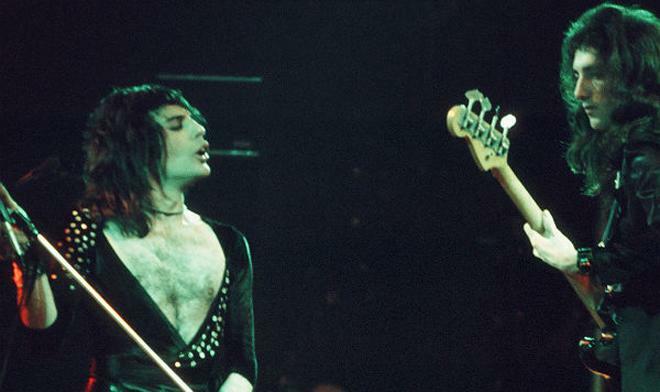 'Queen Live at the Rainbow '74' sounds great, fully bringing this stellar concert event to life. The track doesn't quite reach the same heights as the very best music Blu-rays, but it's pretty damn close. Bonus Tracks (HD, 11 min) – Four bonus tracks -- "Son and Daughter," "Guitar Solo" "Son and Daughter (Reprise)," and "Modern Times Rock 'n' Roll" -- from the band's March 1974 concert are viewable separately or together in upscaled 1080i and the same audio options as the main show. 'Queen: Live at the Rainbow '74' is a fantastic live concert show that highlights the band during an early and important moment in their career. Led by Freddie Mercury's unique charisma and incredible vocal range, this show is full of great songs and memorable performances. Though inherently limited by its source and presented in upscaled standard definition, the video transfer gets the job done and looks about as good as it possibly can. Of course, the real focus here is on the audio, and the 5.1 and 2.0 mixes sound great, offering a full concert experience. Eagle Rock has included four bonus tracks as well, rounding out the package nicely. Buyers should be prepared to curb their expectations when it comes to the video, but this disc is still easily recommended and is a definite must own for big Queen fans.